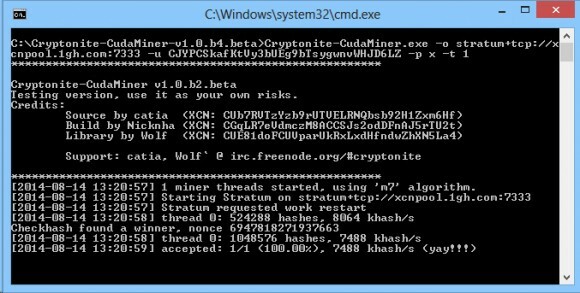 The CudaMiner for CryptoNite (XCN) source is available for a few days already, however we’ve had some trouble compiling it for Windows and now there is a compiled binary available. Djm34 has also released a windows binary of ccMiner with support for XCN, however the binary is compiled for newer cards only and requires CUDA 6.5 support (you may need to update the video drivers as well). The CudaMiner for CryptoNite is a bit limited in the umber of supported features, but works decently and should provide hashrate that goes close to 4 MHS on a GTX 750 Ti GPU. For the moment there is still no AMD-based GPU miner for XCN available.